Today my husband and I celebrate 23 years of marriage! My husband presented me with a reservation confirmation for dinner at Disneyland's Club 33 -- not for today, but in August, on the precise 25th anniversary of our first date, which took place at Disneyland. We will certainly be going in style this year, compared to when we were "starving college students." In 2004 we also celebrated our 20th wedding anniversary at Club 33, thanks to my husband's employer's corporate membership. We also celebrated our daughter's high school graduation at Club 33, so August will mark our third visit. Meanwhile, we'll be eating out elsewhere tonight! THE MAN I LOVE is irresistible from the moment it starts, as the sumptuous title song plays over the opening credits, leading into star Ida Lupino singing the song during a late-night jam session with a group of musicians. I was hooked. Lupino's torch singer, Petey Brown, then goes home to Long Beach, California, to join her family for Christmas: sister Sally (Andrea King), whose husband is in a veterans' hospital with what we now call post-traumatic stress syndrome; little sister Ginny (Martha Vickers); and brother Joe (Warren Brown). Soon Petey is pursued by a womanizing mobster (Robert Alda), while simultaneously she -- somewhat inexplicably -- falls in love with a sad-sack pianist (Bruce Bennett). The film is grand soap opera, with myriad story lines -- probably too many for its own good -- all held together by a wonderful Ida Lupino performance as the charismatic singer. The movie is part romance, part domestic family drama, and part musical, with a bit of film noir on the side. There's great mood, with foggy beaches, musicians playing in smoke-filled joints, dramatic piano music, and Lupino singing in dazzling gowns by Milo Anderson. Ida Lupino's vocals were dubbed effectively by Peg LaCentra, who the same year also dubbed Lupino in ESCAPE ME NEVER. 1947 also saw LaCentra dubbing Susan Hayward in Hayward's Oscar-nominated role in SMASH-UP: THE STORY OF A WOMAN. The film is somewhat risque for its era...for instance, as the worldly-wise Lupino and Alda banter, we notice they're each wearing rings on the fourth finger of the left hand. What's that all about? Nothing seems to be seen of the real Long Beach -- the city of my birth -- although a sign indicating a building is on Pine and a reference to the Pike serve as brief nods to the film's setting. THE MAN I LOVE is, incidentally, credited as the inspiration for a film set in another city: Martin Scorsese's NEW YORK, NEW YORK. The supporting cast includes Dolores Moran, Alan Hale, Craig Stevens (in a small role as a bandleader), and Don McGuire. McGuire also had a career as a writer, including an Oscar nomination for the screenplay of TOOTSIE. The film was directed by Raoul Walsh, who had previously directed Lupino in three other films, including HIGH SIERRA and THEY DRIVE BY NIGHT; THEY DRIVE BY NIGHT was reviewed here earlier this month. THE MAN I LOVE was filmed in black and white and runs 96 minutes. For more, including production photos, see the Official Andrea King Web Site. THE MAN I LOVE has been released on VHS. Vote here for it to be released on DVD. This movie can also be seen on Turner Classic Movies, where it recently aired as part of Ida Lupino Month. THE MAN I LOVE might be called hokum, but it's hokum of the first order, and you won't be able to stop watching. It provides a delicious evening's entertainment, with the music lingering in one's mind long after the end credits have rolled. July 2009 Update: THE MAN I LOVE is now available in DVD-R format from the Warner Archive. Rudy Giuliani promises to govern like Governor Arnold Schwarzenegger. Given Arnold's steady tack to the left in the name of "getting things done," this endorsement of Arnold's governance weakens Rudy's case in my eyes. Rich Lowry of National Review has an excellent summary of recent events: "The fight over the immigration bill was the first instance of an insider parliamentary struggle in which bloggers, talk-radio hosts and citizens were able to have a major voice through the synergistic power of the Internet, radio waves and telephone lines. Bloggers picked apart the bill, talk-radio-show hosts broadcast its flaws, and ordinary people jammed their senators' phone lines -- blocking what had begun as a kind of legislative coup..."
More from Lowry: "The bill's boosters repeatedly were caught mischaracterizing it. Secretary of the Department of Homeland Security Michael Chertoff seemed to suggest that illegals would have to pay back taxes, when the White House had quietly taken that provision out. Bloggers and talk-show hosts publicized this and other problems that otherwise would have gone unnoticed (John McCain learned of the tax provision in a blogger conference call), slowing its momentum... President Bush said opponents hadn't read the bill, when diligent bloggers combed through it line by line." "Now, there is really no such thing as an 'inside game' anymore, since bloggers make sure it gets 'outside.' ...it's clearly an enhancement of democracy. Senators should get used to it, and buy more phone lines." Update: More from Jim Geraghty at NRO. ...as those who will not see. This afternoon Mort Kondracke, appearing on Special Report With Brit Hume's All-Star Panel, blamed the defeat of the immigration bill -- a "tragedy," in his words -- on "loudmouth" "nativists" (a slur Mort has used regularly since Day 1 on this issue) and the "Tom Tancredo wing" of the Republican party. In response to more level-headed questioning from Brit Hume, Mort asserted that the many Americans speaking out against the bill were only against it because they only heard "negative" and "bad" things about the bill. That's right, Mort, the American public is just too stupid and uninformed to truly understand what's in the bill. A bill, I would note, which was still being frantically written and rewritten throughout the entire process...yet I suspect the public tuned in to the Internet and talk radio knew more about the bill than many senators, Exhibit A being George Voinovich. What a shame we don't all have your profound level of knowledge and understanding, Mort. You must be special because you alone seem capable of comprehending what's in the bill and why it's good for us. The rest of us are just uninformed loudmouthed nativists. Sadly, Mort, who I rather like despite his liberal leanings, has once more displayed the contempt felt by typical Washingtonians toward the "little people" who don't know what's good for them. One of my great frustrations regarding this issue is that those supporting the bill respond, as Mort has, from an emotional level, hurling insults. I'm still waiting for Homeland Security Secretary Chertoff to apologize for his comments that those opposing the bill would like to execute illegal aliens. I'll put up a link to a Roundtable transcript when I can find one. Update: More on Mort from California Conservative. Friday Update: The transcript, posted at Real Clear Politics, is now at the subject link. ...that long ago Mitt Romney strapped his dog in a car carrier to the roof of a car for a 12-hour drive. This incident certainly doesn't say much for Romney's common sense. It strikes me as more than strange that his family would willingly discuss this with the media. Saturday Update: Thanks to my dear friend in Massachusetts for sending along this pithy editorial about poor Seamus, the Romneys' dog. The Supreme Court has voted, 5-4, to reject race-based plans for assigning students to schools. Another important step in our nation getting past the divisiveness of labeling people according to skin color, rather than treating all of us as equal human beings. Update: Gotta love this quote from Chief Justice Roberts, "The way to stop discrimination on the basis of race is to stop discriminating on the basis of race." The immigration bill was dealt a stunning defeat today, with 18 senators who voted for cloture Tuesday changing their votes today. Only 46 votes could be mustered for cloture today -- it wasn't even close. Rich Lowry on Voinovich voting against cloture: "That's a Hannity get!" This represents a huge victory for commonsense Americans. Now the question is: The President and Senate have heard the American people. Will they move forward on enforcement? Or are they going to drop the entire issue and continue to let the immigration problem -- and ongoing threats to our national security -- build? Update: Scroll down in this Michelle Malkin post for the list of who voted for and against cloture today. Ohio Republican Senator George Voinovich just made quite a disturbing spectacle of himself on the Sean Hannity radio show. Voinovich hadn't read the immigration bill, hadn't read the Heritage Foundation analysis, was unaware that Senator Hutchinson's amendment hadn't passed today, and for good measure was vaguely supportive of the return of the Fairness Doctrine. Sean attempted to question Voinovich about specific aspects of the immigration bill and what the costs to taxpayers will be if the bill passes, but the Senator plainly had no facts to back his position, and instead ranted about people trying to "intimidate" him. Although Sean offered to keep Voinovich on the entire hour to afford him time to defend his point of view, Voinovich ended the conversation by hanging up on Sean, saying he hoped they could discuss another subject more "rationally" in future. Voinovich was, plain and simple, arrogant, uninformed, and angry about being questioned by the American people. It's quite embarrassing to me as a Republican that he is a representative of my party. Nasty, Brutish & Short live-blogged the conversation as it occurred (subject link). Free Republic also had a live thread on the show. Hannity's website also has a brief thread. Update: The interview reruns today at 2:30 Pacific Time/5:30 Eastern. Further Update: Hot Air now has the story. Late Update: WorldNetDaily on Voinovich's self-destruction today on the radio. The theater had friendly service, was well maintained and had excellent projection. The only drawback was that the original theater had apparently been halved at some point, and the dividing wall wasn't soundproof. About 15 minutes after our movie began, we began hearing sound effects from THE FANTASTIC FOUR next door! Nonetheless, we had a great time. As expected, Clooney, Pitt, Damon, and the rest of the gang were back for more fun. I agreed with a couple of reviews I read, including USA Today: it was better than OCEAN'S 12, though not quite as good as OCEAN'S 11. This time around particular kudos go to Casey Affleck, whose Mexican subplot built to a riotously funny conclusion. Andy Garcia also provided some chuckles as Clooney's longtime enemy turned reluctant co-conspirator. Al Pacino's final scene, with an emotional Oprah Winfrey, provided some of the movie's biggest laughs. Although she was quite effective in THE BIG EASY 20 summers ago (gulp! ), I've otherwise never been a particular fan of Ellen Barkin, and she didn't do much for me in this. The role would have benefited from someone with a lighter, daffier touch...a little more explanatory character background might have helped, too. The movie runs 122 minutes and was directed by Steven Soderbergh. OCEAN'S 13 provides an extremely enjoyable couple hours of summer entertainment. I've been camping outside the small town of Bridgeport, California, since I was a small child. The town and campground have changed very little over the years. Although the main part of town is only about three streets wide, Bridgeport has a wonderful bakery which has been operating for over 50 years, a spectacular courthouse dating from 1880, a charming restaurant which serves reliably excellent breakfasts and lunches, a fascinating museum, and a world-famous sporting goods store. Bridgeport is the kind of small, friendly town where the same woman who waits on you in the post office by day serves you dinner that night, or the waitress who serves you breakfast one day serves you dinner at another restaurant the next day. We've had both experiences! Bridgeport hosts a wonderful Independence Day celebration -- this year is the 145th annual event. We attended in 2005 and enjoyed a parade, Arts & Crafts Festival, used book sale (we came home with a large stack! ), games, and fireworks over the airport that night. Below is Hunewill Ranch, viewed from a moving car (hence the slight blurriness). The ranch lies midway between Bridgeport and our campsite at Lower Twin Lake. The meadows surrounding Bridgeport are as much a part of the area's beauty as the surrounding Sierra Mountains. Some of the interesting sights near Bridgeport include Mono Lake, which is one of the oldest lakes in North America, and Bodie, a gold-mining ghost town, which once was home to 10,000 citizens and is now a state park. More photos can be seen at my pre-trip post. Hope you enjoy this peek at a very special place. Today sees the release of four unusual boxed sets under the umbrella "Cult Camp Classics." 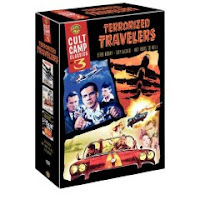 I couldn't resist bringing home Volume 3, "Terrorized Travelers," from Costco tonight. Hard to pass up four of my all-time favorites, Dana Andrews, Linda Darnell, Charlton Heston, and Jeanne Crain, in films with melodramatic titles like ZERO HOUR!, HOT RODS TO HELL, and SKYJACKED. I've already watched the trailer for ZERO HOUR! and it looks like a hokey good time. ZERO HOUR!, along with THE HIGH AND THE MIGHTY, was one of the chief inspirations for the airplane disaster spoof AIRPLANE! The other sets are Sci-Fi Thrillers, Women in Peril, and Historical Epics. For more on these sets, visit The Shelf. Digitally Obsessed has thus far reviewed Volume 1 and Volume 2. More reviews from DVD Savant here, here, and here. The only one he hasn't reviewed yet is the one I bought! While on the one hand Senators are threatening free speech on the radio, on the other hand there was good news from the Supreme Court today. The Court significantly weakened McCain-Feingold's limits on free speech prior to elections: "The court, split 5-4, upheld an appeals court ruling that an anti-abortion group should have been allowed to air ads during the final two months before the 2004 elections." The Court ruled the law "unreasonably limits speech and violates the group's First Amendment rights." Unfortunately, the Bush Administration had argued in support of McCain-Feingold, which the President regrettably signed into law. The Administration "urged the court to ban the ads, arguing that they were meant to influence the elections, not lobby the senators." I believe history will show that support of McCain-Feingold was one of the low points of the Bush Presidency. One of my California senators, Dianne Feinstein, is joining the chorus threatening to bring back the so-called Fairness Doctrine. Feinstein's reason? She doesn't like the way talk radio has approached the immigration bill; she claims talk radio doesn't present information about the bill fairly. So her response is to clamp down on free speech. Ironically, Feinstein's claim that talk radio takes "one or two things" out of the bill to discuss "out of context," "without a lot of information," couldn't be further from the truth. Unlike many senators, talk radio hosts including Hugh Hewitt and Sean Hannity have actually read and studied the entire bill, which runs hundreds of pages. The reality is that it is only on talk radio and blogs where the American people are receiving a complete picture of what's actually hidden in the immigration bill. Senators like Feinstein and Trent Lott don't want the American people to a) hear the truth and b) voice our opinions, and would rather force us to quietly obey the 100 Kings and Queens of the Senate. While on vacation in Bridgeport I had access to several newspapers, including THE NEW YORK TIMES...it was nice to have time to read some papers without racing through them as I so often do during the schoolyear! I noted some stories of interest over the past week, and have combined them with some articles and posts I've read today in order to create a very random reading roundup. At the subject link, Betsy Newmark of Betsy's Page reviews JOHN MARSHALL: DEFINER OF A NATION by Jean Edward Smith. Since reading Betsy's review this book has gone into my Amazon shopping cart. Former Wife of Joseph Kennedy II Says Church Has Reversed Annulment: This link was sent to me by a friend who knows I enjoy reading about the Kennedys. A decade ago I read Sheila Rauch Kennedy's SHATTERED FAITH: A WOMAN'S STRUGGLE TO STOP THE CATHOLIC CHURCH FROM ANNULLING HER MARRIAGE. How fascinating to learn, so many years later, that she has finally succeeded. Route 66 Motels Stamped Historic: From now on I won't be able to think of abandoned Route 66 motels without thinking of CARS. More on this from The San Francisco Chronicle. A Long Line for a Shorter Wait at the Supermarket: How Whole Foods is revolutionizing grocery shopping lines in New York City. Single-Gender Education Gains Ground as Boys Lag: As the mother of a perfectly normal boy who was absolutely not made for the increasingly girl-friendly atmosphere of the modern public elementary school -- with "active," hands-on learning including art, music, science experiments, and, yes, recess largely phased out -- this topic fascinates me. Choptalk: A blog by the editors of Gourmet magazine. Looking forward to checking it out. Wait to Get Into Exclusive Restaurant May Be Longest Ever at Disneyland: All about the legendary Club 33. $485M Overpaid to Storm Victims: Adding to this story, it boggles my mind taxpayers will still be paying for housing for Katrina victims in 2009. It is hard to continue to feel great sympathy for Katrina victims given the way it has been used by so many to scam the American taxpayers. Obituary: John Tracy, 82; Deaf Son of Actor Spencer Tracy, Clinic Namesake: The John Tracy Clinic has helped countless children. When my children were little they received free hearing screenings by clinic employees who visited our preschool. It turns out that Los Angeles City Attorney Rocky Delgadillo, who screamed loudly when Paris Hilton was initially released from jail, was hiding a mountain of ethical problems at the time, including his wife wrecking his city car -- while driving on a suspended license. Delgadillo had the taxpayers pay for the car repair, and has only repaid the city now, following the exposure of the couple's unethical actions. And there is much, much more, including taxpayer-funded babysitting. Delgadillo has no credibility left to serve as a prosecutor, and he needs to resign. On the eve of our trip I was browsing in a Barnes & Noble and came across BACKSTAGE WITH JULIA: MY YEARS WITH JULIA CHILD by Nancy Verde Barr. Barr worked as Child's assistant for 24 years. I'm not very far into it but thus far it's a delightful read. It's a relatively small volume so it shouldn't take long to finish. The book has excellent illustrations, which include not only photos but unique items such as copies of postcards Child sent Barr over the years. More on BACKSTAGE WITH JULIA from The Austin Chronicle. 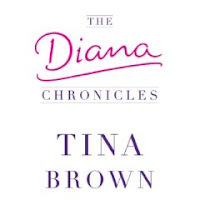 While I was away I also read Tina Brown's THE DIANA CHRONICLES, which was fascinating but sad, and I started THE REAGAN DIARIES, which was really interesting. The Diana and Reagan books were set in a parallel time frame -- i.e., early in the President's diaries, Mrs. Reagan leaves Washington to attend Diana's wedding in London -- so, including the Child book, I was immersed in the '80s on this trip! Came home to the unbelievable news that Southern California grocery stores are once again on the verge of striking. The last strike, in 2003-2004, lasted a mind-boggling 141 days. To make matters worse, our daughter's summer job is at the local Vons. It frankly never occurred to us when she applied that there could be another strike so close in time to the last one! She thought it would be great to work in the neighborhood and not have gas expenses, and so far she's been enjoying it. We're back from a wonderful trip! Thanks so much for all the good wishes posted last week. We had an enjoyable drive north up the 395, which found us shopping for jerky and eating breakfast in lonely Olancha alongside a supporting actor from STARGATE SG-1 and STARGATE: ATLANTIS. The rest of the family, particularly my 18-year-old daughter, are all STARGATE crazy, so seeing someone from SG-1, almost in the middle of nowhere, was a lot of fun. He appeared to be traveling with his daughter so we didn't approach them, simply enjoyed the unexpected "sighting" experience. The brown sign in the background says "Point of Historic Interest" (click on the photo for a larger look) and points down Movie Road, where hundreds of Westerns have been shot since the silent era. The site below can be seen in the background of RAWHIDE and SEVEN MEN FROM NOW. We used a museum-provided map and Dave Holland's great book ON LOCATION IN LONE PINE to "treasure hunt" for movie sites. We also believe we found the location of YELLOW SKY, but those photos were taken with old-fashioned film; however, I'll get a CD-Rom when the photos are developed so I may share those in future. The Museum of Film History was small but nice, with room to improve exhibits as future fund-raising allows. Front and center when you walk in the door is the stagecoach from RAWHIDE. Props, stills, and movie posters from films shot in the Lone Pine area are included among the exhibits. One of the most impressive exhibits, which will hopefully be displayed to even greater effect in future, is a collection of cowboy hats "personally owned" by a large number of Western stars. The amount of "star power" represented by the hats alone was dazzling. The museum has a small theater which shows a 15-minute movie about filming in Lone Pine. They did a good job with it, although the film buff in me would have enjoyed something even longer, with more movie scenes and comparisons to the actual locations. The museum is preserving a valuable slice of film history, and movie fans may want to consider it as a possibility for donations. After saying farewell to Lone Pine, we continued up the 395 and spent the night at one of our favorite hotels, in Bishop. In the morning we fortified ourselves at the bakery before moving on to outlet shopping in Mammoth Lakes. Then to Bridgeport and our campsite along Robinson Creek, near Lower Twin Lake, where we spent a week. To top it all off, we came home to our newly adopted dog! That is a saga in and of itself, but we are now adjusting to life as first-time dog owners. The little Chihuahua mutt who chose us as his family is named Chance -- quick, name the John Wayne movie which inspired his name! His name is also a nod to Sam Elliott's character in the short-lived Western series THE YELLOW ROSE. More to come soon about the trip and other "miscellaneous musings" I've collected over the past week. It's good to be back! I am taking a few days off for family vacation time at one of the most beautiful places on earth, the Eastern High Sierras. This will be the longest time the blog has been "quiet" since August 2005, shortly after I began blogging. It just so happened that last summer we skipped our usual week in the mountains, so we're doubly looking forward to this year's trip. 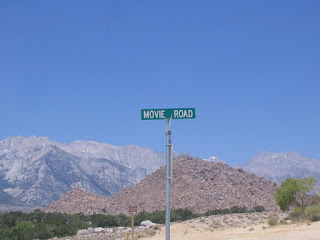 We hope to visit the new movie museum in Lone Pine on our way up the 395. No Internet connections where we'll be staying, camping outside the little town of Bridgeport, California. Film fans: Bridgeport is the town where Robert Mitchum lives in the noir classic OUT OF THE PAST. The town and cemetery were credited by director George Stevens as his inspiration for the setting of SHANE, although he actually filmed the movie in Wyoming. Check back in a little over a week and we'll be back to our usual "Miscellaneous Musings"! The Speaker of the House wants adult -- yes, adult -- children of members of Congress to be able to travel with their parents on the taxpayers' dime. The "most ethical Congress in history" marches on. One of the greatest programs from the "Golden Age of Miniseries" is coming to DVD: MASADA. It will be released on September 11, 2007. MASADA, which depicts the Roman siege on the Jewish fortress Masada, is a show which can truly be called unforgettable. It builds to such an overpowering conclusion that I'm honestly not sure I can rewatch it all the way to the end again, over a quarter century after I first saw it, but if you have never seen this movie, it's truly a must-see experience. A more detailed plot description can be found at the subject link. Peter O'Toole plays the Roman general, Flavius, while Peter Strauss plays the leader of the besieged Jews. O'Toole in particular was brilliant, and Strauss plays well opposite O'Toole. The cast also includes Anthony Quayle, Barbara Carrera, and David Warner. MASADA was directed by Boris Sagal. Trivia for film fans: The late Sagal was married to dancing great Marge Champion, who worked on the MASADA crew as a dialogue coach. Sagal's children, by a previous marriage, include actress Katey Sagal. The stirring musical score was by Jerry Goldsmith. The music was released on LP shortly after the TV airing. The miniseries I'm most anxiously hoping comes to DVD: EAST OF EDEN (1981), starring Jane Seymour, Timothy Bottoms, Sam Bottoms, Bruce Boxleitner, Karen Allen, and Anne Baxter. Click on this Amazon page if you would also like to see EAST OF EDEN on DVD. Florida Democrats: Kill Rush Limbaugh Fans? This sounds like a joke, but sadly it's not much of an exaggeration, if it can be called an exaggeration at all. Several members of the all-Democrat Broward County Commission are considering no longer airing hurricane warnings on one of the area's most popular radio stations, because -- are you ready? -- the station airs Rush Limbaugh's show. Now, in a world where common sense prevails, one would think airing emergency warnings on a station with as many listeners as Rush has would be ideal, enabling as many local residents as possible to receive critical information during an emergency. The Broward County Commissioner said of Rush and other conservative programs, "They have every right to speak, but we don't have to do business with them." Since when is saving your constituents' lives "business"? It appears the folks running Broward County would be happier to see Rush's conservative audience dead in the next disaster. The Miami Herald reports it looks like the Commissioner's attempt to drop working with the station will fail. Rush sums up the brouhaha. September 25th will see the release of a set of four Judy Garland-Mickey Rooney MGM musicals, BABES IN ARMS, BABES ON BROADWAY, STRIKE UP THE BAND, and GIRL CRAZY. Extensive extras will include introductions by Mickey Rooney, commentaries, and radio shows, as well as Robert Osborne's PRIVATE SCREENINGS interview with Mickey Rooney and a collection of 21 Garland musical numbers. Trailers, cartoons, and shorts complete the set. The DVD artwork is available at DVD Times (subject link). I'm all for it, but I doubt it will ever happen. Too many Americans are unwilling to be independent of Big Government and its services, even if those services are often of a poor quality. For an example of your efficient government schools at work, see this post by Ugly Naked Guy. The UNG is a teacher working hard to make a positive difference in a public school, but the school bureaucracy sure doesn't make it easy for him. I'm sure he could tell countless similar stories, and as a parent who has past experience with the public school system, I could tell more than a few such stories myself. Media Bistro's "TV Newser," Brian Stelter, just graduated from college, and has now been hired by the New York Times to cover media stories. Media Bistro is searching for a replacement. Brian will be missed at TV Newser but I look forward to his future reporting for the Times. 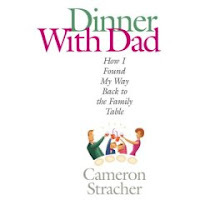 USA Today had an interesting article today about a new book, DINNER WITH DAD: HOW I FOUND MY WAY BACK TO THE FAMILY TABLE. It was written by a law professor who decided to "power down" his life and commit to being home for dinner five nights a week, as well as taking on cooking duties some nights. About two and a half years ago I decided it was time to take my cooking skills -- which hadn't changed much since I married many moons ago -- to the "next level," in part so we could have more enjoyable family dinners eating a wider variety of food. I wanted my meals to compete more favorably with restaurant fare, and I also wanted to pare down our family food budget by eating more home-cooked meals. There have been many benefits for our family, including all of our children developing a greater interest in cooking. My two youngest children are especially interested in cooking and think a trip to Williams-Sonoma is wonderful fun. My 12-year-old daughter is teaching herself cake decorating, and when my 9-year-old son recently had some birthday money saved up, he got his very own "kitchen tool," a Kitchen Aid hand mixer in yellow -- his favorite color! Since then we have enjoyed his mashed potatoes, cakes, and cookies! ...on June 12, 1987, President Reagan spoke the immortal words "Mr. Gorbachev, tear down this wall!" Power Line has the You Tube video and excerpts from speechwriter Peter Robinson's excellent book, HOW RONALD REAGAN CHANGED MY LIFE. A postage stamp honoring the late President Gerald R. Ford was unveiled this evening at a ceremony attended by Vice President Cheney. The stamp goes on sale August 31, 2007. Senator McCain today blamed the defeat of his immigration bill on "the more conservative anti-immigrant, anti-legislation group." The Senator also said "...those who have a better idea can give it to us." Senator, the "better ideas" have been available to you for months, you just don't want to listen. The wait is almost over: the eagerly awaited return of Disneyland's Submarine Voyage will take place on Monday, June 11th. The ride is now called the Finding Nemo Submarine Voyage. The submarine fleet recently celebrated a recommissioning ceremony before the park opened for the day. Vice Admiral John Morgan Jr. of the United States Navy was on hand as the submarines were rededicated. The Disneyland Report has wonderful photos of the event. Facts and figures about the new ride can be found at the L.A. Times. Yesterland provides a peek at the ride as many of us remember it from years past. Disney Submarines is another fun site. And don't forget to visit the Virtual Lagoon. This morning's L.A. Times included a full poster for the new ride which will make a wonderful keepsake for Disneyland fans. Monday Update: Be sure to read an excellent article from Monday's L.A. Times, "Back From the Depths." Stephen Hayes, who has closely covered the not-quite-official Fred Thompson candidacy for the Weekly Standard, details the carefully planned guerrilla campaign which has used the new media to launch Thompson into an "overnight" candidate. As Ed Morrissey notes at Captain's Quarters, "Thompson may be the only primary candidate in both parties who has not tried to burn rubber at the line. He has taken his time, watched the field carefully, and used the viral-marketing approach not to raise funds but to lay out his perspective on issues and events... Fred has made himself a conservative alternative almost overnight -- except that it took him seven months to do so. And as Hayes notes at the end of the piece, he hasn't had to spend a dime to do it." The California State Controller's office has, in recent years, made it a practice to seize bank accounts and safe deposit boxes which have been "dormant" a mere three years. There is no prior attempt to contact the rightful owners, and if the legal owner does attempt to claim his property, the state pays no interest...if the owner can get it back, that is. If the state has sold your stock at a loss, tough luck. The State of California is relying on these seizures as a source of regular revenue. If you happen to take a job out of town for a couple years, or don't touch your safe deposit box or account for any other reason, the State of California says it belongs to the state, not you, and they won't bother to try to find you first. Some of the dormant accounts seized in recent years belonged to large companies, including Disneyland and the L.A. Times, who obviously could be easily located by the bank or the state. As described by Mark Landsbaum of the Orange County Register, "The controller argued in court that the state stood to lose $600 million every year if the process were halted by court injunction." Former Controller Steve Westly also complained that "losing pending lawsuits seeking 'notice prior' to seizure would mean as much as $1.5 billion in damages against the government." On June 1st a District Court judge ordered California to cease and desist the un-Constitutional seizure of private property. Another disturbing story of governmental overreach, where state power -- and acquiring the revenue to keep feeding that power -- is deemed more important than serving state citizens. Mark Steyn on "Undocumented Americans"
Steyn used to joke about undocumented Americans. Now Senate Majority Leader Harry Reid is attempting to make that concept reality. Steyn asserts that if Reid and the rest of the pro-amnesty crowd succeed, "the very concept of citizenship is dead." Steyn speaks with particular knowledge on the subject, being a legal immigrant himself. I admit it: I'm going to have to read Tina Brown's new biography of Diana, Princess of Wales. Brown had access to a number of people who knew Diana well and have not previously spoken for publication. Fascinating tidbits for royalty watchers can be found in this article in London's Daily Mail. More in USA Today and another article in the Daily Mail. The latter article contains some touching anecdotes about how Diana's sometime nemesis, Prince Philip, comforted William and Harry after their mother's death. THE DIANA CHRONICLES is released this Tuesday, June 12th. Christopher Andersen has a reasonably good track record writing well-researched People-ish celebrity bios, but his new book AFTER DIANA is controversial as he hauls out the old story questioning Prince Harry's paternity. It sounds like Brown's book is the one to pick up if you're in the market for a summer read on Diana. If you're looking for a more serious royalty read, this summer my daughter is prepping for a fall college history class on the British Empire by reading Stanley Weintraub's great biography VICTORIA: BIOGRAPHY OF A QUEEN. I have no sympathy for this troubled young lady's bad behavior, which has endangered the public, but as I commented Thursday in a discussion thread with Anne at Just Muttering, the underreported story is that what's unusual about Hilton's treatment is not that she was freed to serve at home -- it's that she's serving any time at all, in a jail where a 90-day sentence typically means anywhere from hours to a day or two served, and sentences over 90 days are served at rates as low as 10 percent, which is often far less than even her reduced sentence of 23 days. Some links I rounded up on the state of the California penal system, particularly the L.A. County jail, can be found in the discussion at Just Muttering. The judge is attempting to make Paris an example, and she's also being used as a pawn in a power struggle between the judge and the county sheriff. Based on the cases I've been exposed to via my legal proofreading business, my understanding is that once a defendant is sentenced to county jail, it's usually out of the judge's hands and a matter for the sheriff. Judges regularly sentence defendants to county jail with the realization that their sentence will, in all likelihood, not be carried out. To their credit, the New York Times and the L.A. Times pick up on this angle today, but the media in general have not done an adequate job covering this story, with many instead portraying her "special treatment" as getting out early. June 13th update: More from the L.A. Times, which conducted a study verifying that Hilton is doing more time than a majority of inmates sent to the L.A. County Jail. In "Nothing to See Here, Move Along" (subject link), Michelle Malkin turns up the news that the probe of the JFK plot is widening into an international manhunt, with suspects including an Al Qaeda fugitive. Which makes the New York Times' insistence that the plot was a non-story deserving to be buried on Page 30 look increasingly a) foolish, b) politically motivated, or c) both. From Minneapolis to Boston, Part Two: A wonderful -- and largely ignored -- story of heroism on a Northwest Airlines flight. Calif. Healthcare Overhaul Moves Forward: Arnold's plan to take over healthcare marches forward in the state legislature, but his attempt to label the new taxes of doctors, hospitals, and others "fees" is failing: the nonpartisan legislative counsel's office says the fees are taxes. This means Arnold's plan will need 2/3 of the legislature to pass, rather than a simple majority. Out of the Shadows: NRO's editors write, "Leaders of both parties had agreed on an immigration plan, and everyone they knew was on board. They seemed confident that they could marginalize their opponents, caricaturing them as bigots and silencing them in Congress. So what happened? What happened is that the American people came out of the shadows..." NRO editor Kathryn Jean Lopez's thoughts on President Bush and conservatives are also worth a read. Emeril Lagasse Named Grand Marshal of Rose Parade: Bam! Emeril will kick it up a notch on January 1st, 2008. Iowa, O! Iowa: The political landscape may be changing forever, as leading candidates decide to skip Iowa's straw poll this summer. With big primaries in California and Florida frontloaded to early in 2008, is the importance of Iowa and New Hampshire in the primary process forever altered? Ocean's 13 is 'Grand' Theft: Sounds fun, hope to see it soon. ...we could possibly do 24-hour background checks on millions of illegal aliens, but we can't deal with processing millions of passport applications for legal residents, even for those who have paid extra for expedited service? I really have a problem with the pie-in-the-sky Senators who have been trying to dupe the American public into believing their "normalization" plan had any hope of success. Sean Connery says he's going to pass on reprising his role as Indiana Jones's father in the newest Jones movie, and stick to retirement. Connery's advice to Harrison Ford: "Demand that the critters be digital, the cliffs be low, and for goodness sake keep that whip by your side at all times in case you need to escape from the stunt coordinator!" His presence will be missed. The California trucking industry provides the backdrop for a fascinating story of romance and murder. Joe (George Raft) and Paul Fabrini (Humphrey Bogart) are brothers trying to make a go of it as truckers, fighting lack of sleep, corrupt businessmen, and a truck repossessor. Things start looking up when Joe falls in love with a pretty truck stop waitress (Ann Sheridan) and later gets a good job with a growing trucking company. But the boss's wife (Ida Lupino) has her eye on Joe and will stop at nothing to have him. The film starts out as a good example of Warner Bros.' films about working-class characters, then abruptly segues halfway through into a noirish tale of murder and madness. ("The doors made me do it!" is one of those lines you'll never forget.) Despite the movie's schizophrenic nature, it's a must-see, with crackling dialogue and a standout performance by Ida Lupino. She has a remarkable scene where her thoughts are entirely conveyed by the changing looks in her eyes, yet you can "see" every word she's thinking. The supporting cast includes Gale Page (FOUR DAUGHTERS, DAUGHTERS COURAGEOUS) as Humphrey Bogart's patient wife. Alan Hale, Roscoe Karns, George Tobias, and Joyce Compton (SPRING MADNESS) round out the cast. THEY DRIVE BY NIGHT was directed by the great Raoul Walsh, who later that same year directed Bogart and Lupino in the classic HIGH SIERRA. The movie was filmed in black and white and runs 93-95 minutes. The murder story in the plot was borrowed from a Bette Davis movie called BORDERTOWN (1935). A good trailer can be seen here. THEY DRIVE BY NIGHT can also be seen on TCM, where it recently aired as part of this month's tribute to Ida Lupino. May 2017 Update: THEY DRIVE BY NIGHT has been reissued on DVD by the Warner Archive. "A Major Victory for the Conservative Grass Roots"
That's the response of John Hinderaker at Power Line to tonight's defeat -- at least for the time being -- of the cloture vote on the Senate's immigration bill. Michelle Malkin live-blogged the proceedings all day and all of her posts contain interesting information. Her final post of the night contained the votes. It was fascinating, Senator Barbara Boxer of California voted with most of the Republicans against cloture. Maybe the bill wasn't liberal enough for her...or maybe she's aware of how unpopular the bill seems to be as reflected in polls and didn't want to anger her constituents. 11 Democrats joined Boxer in voting against cloture. California's other Democrat Senator, Dianne Feinstein, on the other hand, voted with the Democrats. While Senators McCain, Graham, and other Republican architects of the "grand bargain" voted with many Democrats for cloture, Senator Kyl turned his back on the bill he'd helped to create and voted against it. Trent Lott, who had an unbecoming, arrogant hissy fit over his fellow Republicans not supporting the bill, backed off at the last moment and also voted against cloture. Dean Barnett suggests that Republicans are not as divided as has been suggested by some pundits: "I have never seen the Republican Party more united than in its hatred for this bill. On one side you have George Bush, Lindsey Graham, Trent Lott and John McCain. On the other side, you have virtually every other Republican in America save the Wall Street Journal editorial board. 30 million people united against roughly 13 individuals - when you think about it, that’s pretty good unity." Of course, Harry Reid and Co. will try to spin this victory into a Republican defeat -- Harry Reid said "Democrats vote for the bill, Republicans vote against it, the president fails again." But the reality is that this was a victory for common sense and national sovereignty. Hopefully now, as Captain Ed suggests, we can get down to dealing with this problem issue by issue, starting with securing the border. The head of NASA, Michael Griffin, has apologized for expressing his "personal views" doubting the existence of global warming. Griffing told scientists at the Jet Propulsion Lab in Pasadena "I feel badly that I caused this amount of controversy over something like this." Heaven forbid scientists debate scientific theories! Straying from politically correct orthodoxy is controversial, but silencing those with dissenting ideas is not. Patrick Ruffini reports at Hugh Hewitt's site that Fred Thompson's new website is racking up some impressive numbers. In 18 hours Thompson raised close to a quarter million dollars. The New York Times has offered some lame excuses for burying their story on the JFK airport plot on Page 30. Besides insisting that the plot was not developed enough to endanger JFK -- in which case, one would think it's newsworthy it was interrupted before it could come to fruition? -- the paper also seemed to feel that because we are now facing these threats on a repeated basis, they lose their newsworthiness. They certainly seem to be buying into John Edwards' theory that terrorism is not a real threat. Isn't informing the public of the ongoing threats to their safety, despite the fact plots are "interrupted," an obligation which a newspaper should take seriously? Of course it is...but that doesn't fit the Times' agenda. McCain: "Not Going to Erect Fences and Barriers"
Well, there you have it, straight from Senator John McCain: further confirmation that the immigration bill is about amnesty, not border security. Power Line on McCain: "...he probably gave the game away, stating that America is a shining city and we're not going to build a fence around it. McCain thus confirmed the worst fear the Republican base has about him, that he doesn't really care about immigration enforcement." Ed Morrissey: "...politically, it's suicide. He just reinforced the notion that he won't actually follow through on border security." I suppose McCain agrees with Harry Reid that the illegal aliens crossing our borders are simply "undocumented Americans." An angelic governess (Ingrid Bergman) is pitted against a manipulative shrew (Susan Hayward) in the family saga ADAM HAD FOUR SONS. ADAM HAD FOUR SONS spans the years from 1907 through the end of World War I, depicting the Stoddard family's joys and tragedies. Ingrid Bergman plays Emelie, the devoted French governess to the four Stoddard boys. It's a bit of a tearjerker in the early going, but when bad girl Susan Hayward marries into the family, things perk up, leading to a climactic confrontation between the two women once Bergman has had enough of Hayward's sneaky shenanigans. Although the film has a touch of old-fashioned melodrama, it's engrossing and worth seeing. Warner Baxter plays Adam Stoddard, and Fay Wray plays his wife, Molly. Character actress Helen Westley plays Cousin Phillippa. The Stoddard sons are portrayed as young men by Richard Denning, Johnny Downs, Robert Shaw, and Charles Lind. June Lockhart, who was 15 at the time the film was made, is appealing as Vance, the somewhat fey next-door neighbor who has a crush on the youngest Stoddard son. Lockhart began her film career in 1938, appearing with her parents as members of the Cratchit family in A CHRISTMAS CAROL. June then appeared in the Bette Davis film ALL THIS, AND HEAVEN TOO; following ADAM HAD FOUR SONS she played Rosie York in the classic SERGEANT YORK. Lockhart has acted steadily ever since, including MEET ME IN ST. LOUIS, LASSIE, LOST IN SPACE, GENERAL HOSPITAL, and even a 2006 episode of GREY'S ANATOMY. (Her fellow guest star in that episode was another former MGM actress, Betty Garrett.) June's daughter Anne continues the family acting tradition. ADAM HAD FOUR SONS was filmed in black and white and runs 81 minutes. It was directed by Gregory Ratoff. Last year the movie aired for the first time on TCM. It's also available on VHS and DVD. Reviews of the DVD can be read at Digitally Obsessed and DVD Talk. The number crunchers at the Congressional Budget Office have calculated that the illegal immigration bill currently under consideration in Congress would reduce illegal immigration by only 25% per year. Details at the Washington Times (linked above). As Ed Morrissey writes at Captain's Quarters, "Without ending illegal immigration, we can't proceed with normalization. We will eventually build up a new base of people 'living in the shadows,' and it will eventually require another normalization effort." Unless something unexpected happens -- I haven't quite gotten over George Allen's implosion -- it's looking more and more like Fred Thompson is the candidate I could most enthusiastically support. Regarding Thompson's campaign strategy, Fund writes "Mr. Thompson will run an unorthodox campaign, one that will challenge the conventional wisdom about how to run for president. Even if it proves unsuccessful, it's useful for a candidate to occasionally come along and ask if the rules everybody is following were made for a different time and new approaches are appropriate." The news of the plot by Islamic terrorists to blow up Kennedy Airport didn't rate front-page coverage on the New York Times, nor did it make the front of the National section. The NYT buried the story in its regional news, with just a "tease" on Page 1. By contrast, the major out-of-state papers in Washington and California ran it as the front-page headline story. The NYT's reluctantance to acknowledge the very real threat posed by Islamic terrorism raises all sorts of questions in my mind about the paper's motivations. Tuesday Update: The New York Post takes the New York Times to task. The Post lists the stories that the Times felt qualified for the front page instead of the terror plot -- which included bricklaying in India and how to maintain violins -- and concluded: "Let's be clear here: The 'paper of record' isn't guilty of merely poor news judgment. It's got an agenda." This summer I'm particularly looking forward to NO RESERVATIONS, starring Catherine Zeta-Jones. Zeta-Jones plays a top chef who unexpectedly finds herself parenting her orphaned niece. The "unexpected parent" plot has been done many times before (think BABY BOOM and STEPMOM), but Zeta-Jones is always an interesting actress, and the restaurant setting adds a fresh twist. The film costars Aaron Eckhart (ERIN BROCKOVICH), Abigail Breslin, and Patricia Clarkson. As mentioned here recently, Breslin has been announced as the star of the next American Girls movie, which will be released in theaters in 2008. The trailer for NO RESERVATIONS can be seen here. NO RESERVATIONS opens July 27th. Trinity Sunday is one my favorite days on the church calendar. It is a cherished tradition at our church to begin the service singing "Holy, Holy, Holy" on this day each year. The music for this hymn can be found at the Cyber Hymnal at the subject link. 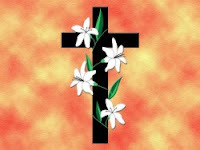 Wishing all my readers a blessed Trinity Sunday. I've got to try one of these cupcake bakeries... I've been meaning to get to this one which isn't terribly far away. Or maybe this one in Newport Beach...they have locations opening soon across the country and around the world. David Limbaugh succintly articulates the thoughts of many conservatives -- myself included -- on the immigration bill, as well as our disappointment with how the President has characterized the bill's critics. An excellent read which sums up the recent developments on this topic. LOVE BEFORE BREAKFAST is a typically giddy screwball comedy. As the story begins, business magnate Scott Miller (Preston Foster) is in hot pursuit of beautiful Kay Colby (Carole Lombard), who's just become engaged to Bill Wadsworth (Cesar Romero). Scott will stop at nothing to win Kay's hand, even if it means buying the company Bill works for so he can ship Bill off to work in Japan. It's a lightweight story without much to it, but Carole Lombard is onscreen about 97% of the time, and that's really all that matters. Lombard looks glamorous as always, atttired in Travis Banton gowns, and no one else could ever quite match her unique combination of beauty, daffiness, and vulnerability. Cesar Romero is always fun, and Preston Foster acquits himself adequately as the film's leading man. Betty Lawford, who plays the Contessa, was a cousin of actor Peter Lawford. Janet Beecher plays Carole's mother. Beecher made roughly 4 dozen films in a 10-year period; among her best-known roles was Tyrone Power's mother in THE MARK OF ZORRO (1940). LOVE BEFORE BREAKFAST runs a quick 70 minutes and was filmed in black and white. Master screwball writer-director Preston Sturges is said to have worked uncredited on the screenplay. Walter Lang directed many classic musicals previously reviewed here, including STATE FAIR, MOON OVER MIAMI, SONG OF THE ISLANDS, and WEEK-END IN HAVANA. (Click titles for reviews.) Lang's other titles include SITTING PRETTY, CHEAPER BY THE DOZEN, DESK SET, and THE KING AND I. LOVE BEFORE BREAKFAST is available on DVD as part of the 6-film Carole Lombard Glamour Collection. Another film in the set, THE PRINCESS COMES ACROSS, was reviewed here last July. Although there are no extras in the DVD set, the prints of both films I've seen have been excellent, and the set is quite a bargain, given that it contains six films and is generally available online for under $20. Update: LOVE BEFORE BREAKFAST is now also available as a single-title DVD from the Universal Vault Series. British newspapers have begun carrying new information from Carl Bernstein's Hillary Clinton biography, A WOMAN IN CHARGE, due to be released this week. The Times of London published a lengthy, interesting excerpt (see subject link), which is not particularly flattering toward Mrs. Clinton. London's Telegraph reports that Bernstein believes Hillary suffered recurring bouts of serious depression. From the Telegraph: "Although the Clinton campaign has attempted to dismiss the book, Bernstein's pedigree and sympathy towards the former first lady's policies make this difficult. "Advance media coverage has focused principally on suggestions that the Clintons came close to divorce in 1989. But accounts of Mrs Clinton's temper, tendency to bear grudges, lying, detachment and struggle to establish her own identity are likely to prove more damaging. The prospect of a commander-in-chief who might be prone to depression during a crisis could deter voters." Jeff Gerth's Hillary bio, HER WAY, is being released a few days after Bernstein's book. Meanwhile, don't miss Rich Lowry taking on Hillary's recent speech in support of socialist economic policies. ...the winner of this week's National Spelling Bee is a homeschooler? It seems that most of the major media are ignoring that fact, which is rather interesting given how frequently children are identified by their grade and school in media stories of this nature. A homeschooler also won the Geography Bee this week. She was the second girl to win the Geography Bee in the last 17 years. FReepers noted that CNN dropped the homeschooling info from their Geography Bee story -- it was mentioned in other media reports -- with one post musing "I wonder if this is a new tactic by the MSM to downplay the advantages of homeschooling and the academic prowess of many homeschooled kids." "Parents of babies and toddlers will be expected to record their child's progress in new 'learning diaries' under a £9million Government scheme." "They will be encouraged to log details of every activity attempted by their children, ranging from stacking play bricks to singing nursery rhymes. "The diaries will be scrutinised by childcare experts to check that parents are doing all they can to prevent their offspring falling behind. "...the initiative, the latest in a series of interventions in the lives of the youngest children, is certain to provoke renewed claims of 'Nanny State' interference."